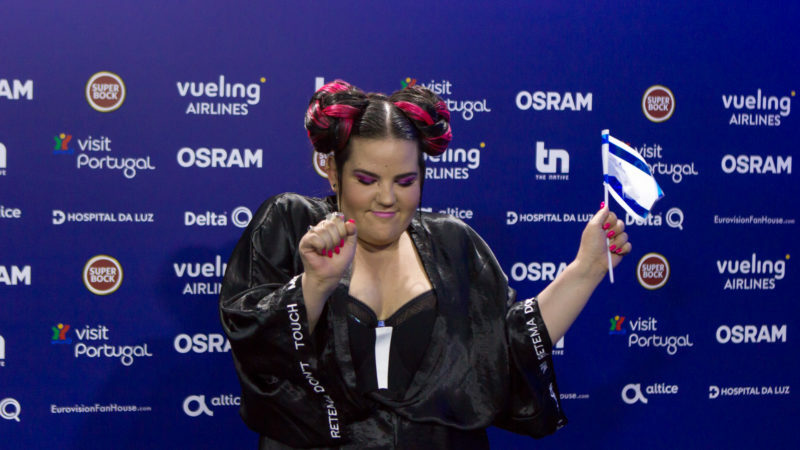 Netta Barzilai thanked the contest's voters for "accepting differences between us". One could only wish Israel would espouse the same principles. Let us get something straight: I could not care less about Israel’s “European credentials” (Europe’s geographic boundaries being as mythical as the woman it owes its name to). I am also not here to comment on the quality of Netta Barzilai’s song ‘Toy’. In part because I am no expert in pop music. But also because if we were to go down that line of argument, we’d have to question a hell of a lot of Eurovision winners along its 61 years of existence. And I am also not going to go on about the rather problematic Japanese-themed wardrobe and setting Barzilai used for her performance. There should certainly be space for criticism and debate for these issues, but that is not what I will take up in this piece. The bone I have to pick is with the undeniable violence that will ensue from her victory and Israel’s consequent hosting of the event next year. Those branding Netta’s triumph the “worst possible result” are not simply being hyperbolic. Her success will bolster Israel’s pinkwashing campaign, further entrench divisions in the divided city of Jerusalem, and possibly result in the deaths of dozens more Palestinians at the hand of the Israeli state. Eurovision is a strange world of European politics scrambled with an amped up celebration of difference and LGBTQ pride. Something akin to dropping a glitter-bomb in the streets of Zagreb in 1980. When Russia came close to winning the contest last year, the nation’s entrant, Yuliya Samoylova, was booed every time she showed up on the screens. And in many ways rightly so. Samoylova is naturally not to blame for Russian President, Vladimir Putin’s openly homophobic statements and policies, but she became the face of Russian hypocrisy. You can’t expect to host the highpoint of the international LGBTQ calendar while equating gay marriage to pedophilia. But political scrutiny does not seem to apply as rigorously to Israel, where pinkwashing strategies have been widely used since at least 2005. And pinkwashing – the use of the gay rights movement to distract from or totally obscure all sorts of oppressive or corrupt policies – has been a highly successful in rebranding Israel as a idyllic holiday destination, an LGBTQ party haven. For every time Palestinian right’s campaigners cried out against human rights abuses in Israel, or the West Bank, or Gaza, Israeli Prime Minister Benjamin Netanyahu has been able to claim that, on the contrary, his country is the only true democracy in the Middle East, you just have to look at Israel’s thriving gay scene. A state that killed between January and November 2017 a horrifying total of 62 Palestinians (including 14 children), a state that denies half of its citizens’ their rights based on ethnic lines, a state that conducts a widely condemned colonial campaign into Palestine, will for the next 12 months be celebrated as the great beacon of liberation. Netta Barzilai’s farewell cry, “Next year, Jerusalem!”, points at another worrying development. Because, while Jerusalem is Israel’s official capital, it is also a city divided on cultural, religious, and political lines. Indeed, a city physically divided, by a 8 meter-high wall, separating East and West Jerusalem, on ethnic segregatory lines – Israelis to one side, Palestinians to another. Arabs crossing the barrier’s checkpoints find themselves often harassed, barred, and oftentimes assaulted by Israeli military. The city is rife with tensions and has been the stage of some of the most shocking killings over the past years. To host an event in Jerusalem – rather than Israel’s arguable gay capital, Tel Aviv – is to incite further tensions, violence, and to encourage the Israeli state to further “increase security measures” that, if recent history informs us correctly, would lead to further deaths. Indeed, it will grant the Israeli military a veneer of respectability and legitimacy, when indulging in acts of simple brutality. And while Jerusalem has not yet been officially confirmed as the host city for Eurovision 2019, it would be no surprise if that were to happen. The new US embassy opens in the city today, with at least 29 Palestinians injured in the protests preceding the opening ceremony. Netanyahu and Israel’s imperialist project have been unquestionably emboldened by the new US administration. The Eurovision result would be, in very different circumstances, a reason to commemorate, a true and joyful celebration of difference and acceptance. But for millions the festival will now mean only terror, violence, and the reminder that accepting difference in Israel stops short at Palestinian existence.